–the first woman to chair the Senate Select Committee on Intelligence. 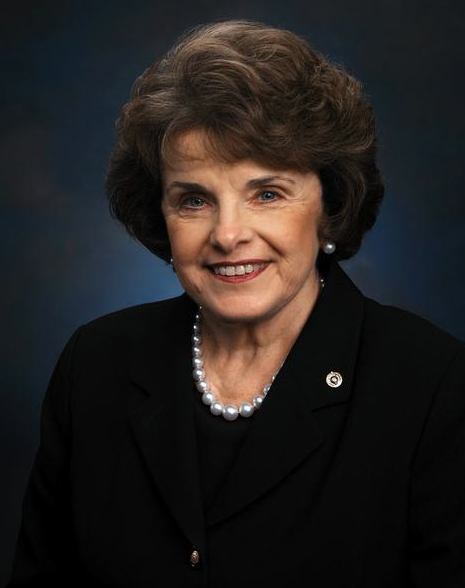 Dianne Feinstein was active in government as early as high school and, after graduating with a bachelor’s degree, she worked in city government. Her first political race was for the San Francisco Board of Supervisors. She served for two and a half terms, later serving as the board’s president. She also ran for mayor twice during this period, but lost both times. Her rise to mayor came from a tragedy in 1978. A disgruntled city supervisor assassinated then Mayor George Moscone and another supervisor, Harvey Milk. Feinstein filled the remainder of Moscone’s term and then was elected in her own right. She served for ten years. City and State magazine named her “Most Effective Mayor” in the nation. When Dianne Feinstein ran for Governor of the State of California, she lost and, in a turn of events that seems almost like a game of musical chairs, she became Senator from California. Feinstein’s opponent for Governor was Pete Wilson, then U.S. Senator from California. When he stepped down from his Senate seat to become governor, Feinstein won his Senate seat in a special election. Because she took office immediately, she is Senior Senator from California, even though Barbara Boxer was elected to the Senate in the same election. During Feinstein’s first term as senator she co-authored the Gun Free Schools Act, the Hate Crimes Sentencing Enhancement Act, and legislation to ban the manufacture, sale and possession of military-style assault weapons, all of which passed and were signed into law. In 1984, before the Democratic National Convention, rumors abounded that Walter Mondale would select a woman for Vice-President and Feinstein’s name was on his list. A woman was selected, but it was Geraldine Ferraro, not Feinstein. Feinstein continues to champion gun laws, laws to protect our national security and laws related to crime and punishment. She also is passionate about protecting the earth’s environment and citizen’s health. In 2010 The New York Times said Feinstein appeared more often on Sunday talk-shows than any other woman. That record probably still holds, because, as chair of the Committee on Intelligence, she is often in today’s news whiles the country debates surveillance of its citizens. She holds another record, not just as a woman, but as an elected U.S. Senator. In 2012 she won 7.75 million votes, more votes than any other Senator in history. Has tragedy ever made you stronger? This entry was posted in Contemporary Women, Government Politics and Law. Bookmark the permalink.